Courtesy photo Four Bark River-Harris wrestlers qualified for the Division 4 regionals with top four performances at districts Saturday in Munising. Pictured from left: Wyatt Massie, Devin Racicot, Austin Kleiman and Avry Corrigan. MUNISING — They brought just eight wrestlers, but that didn’t stop the Bark River-Harris Broncos from making some noise here in Saturday’s Division 4 individual district tournament. 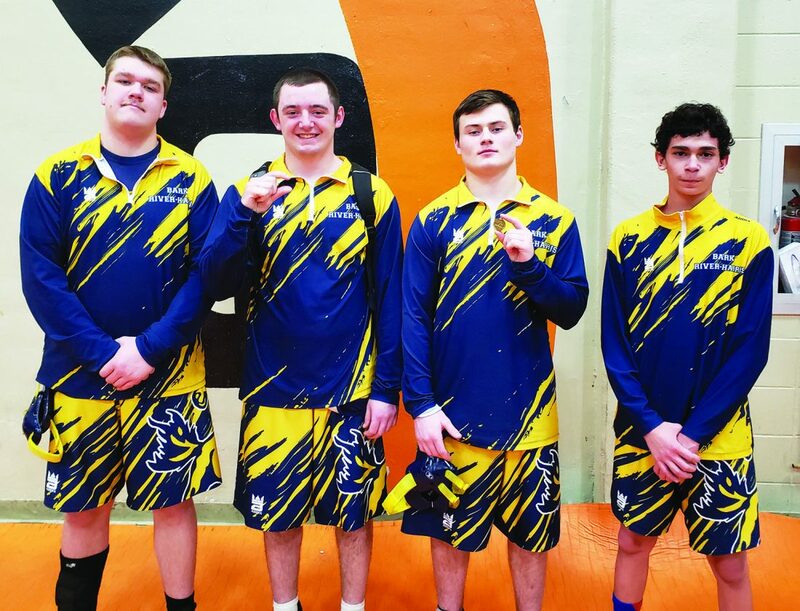 Seniors Wyatt Massie and Devin Racicot, junior Austin Kleiman and freshman Avry Corrigan punched their tickets to next Saturday’s regional at Charlevoix by placing among the top four within their respective weight classes. “This meet went well for us,” said BR-H coach Joe Racicot. Massie reached the 285-pound final where he got pinned in 81 seconds by Munising senior Richard Sneller. “He had a lot more weight than I did,” said Massie. Corrigan refused to be pinned, but still dropped an 11-2 decision to Rudyard sophomore Brad Hall in the 103 championship bout. Devin Racicot (215) dropped a 6-0 decision to Westwood junior Jackson Vidlund and Kleiman (189) got pinned in 38 seconds by Ishpeming senior Andre Walsh in third-place matches. BR-H visits Iron Mountain for its team district match tonight at 6. Manistique juniors Tony Williams (130) and Isaac Brewster (285) won their third-place bouts, with Williams pinning Onaway sophomore Dylan Crow in 4:36 and Brewster doing likewise against Iron Mountain junior Giovanni Colavecchi at 5:27. Westwood senior Sam Gilles (215) improved to 37-1 this season by pinning all three of his opponents, including Newberry senior Lance Bowler 1:48 into the title match. 160 — Carlson, W, tech fall (20-5) over Crawford, Pell. 112 — Stroud, IM, pinned Derocha, W, 2:32.